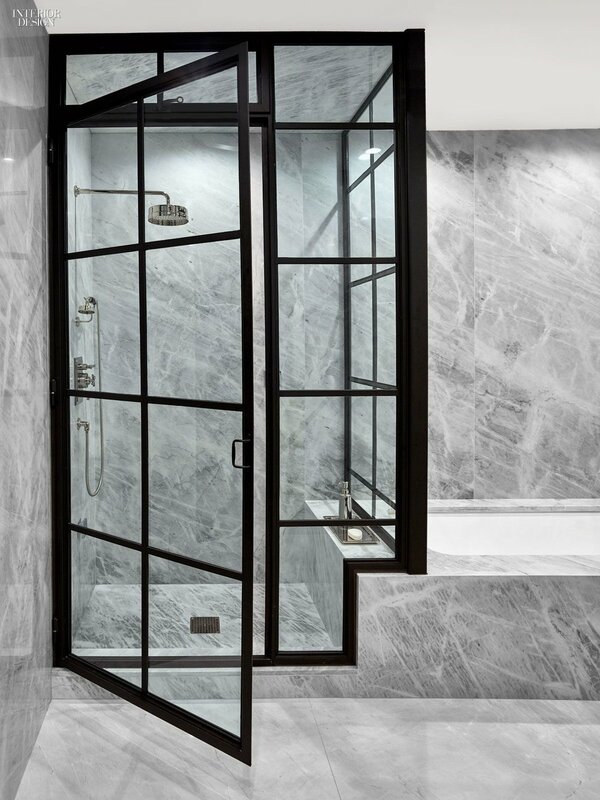 Interior designer Jean-Louis Denoit uses marble slabs when he designed this Miami Beach bathroom. 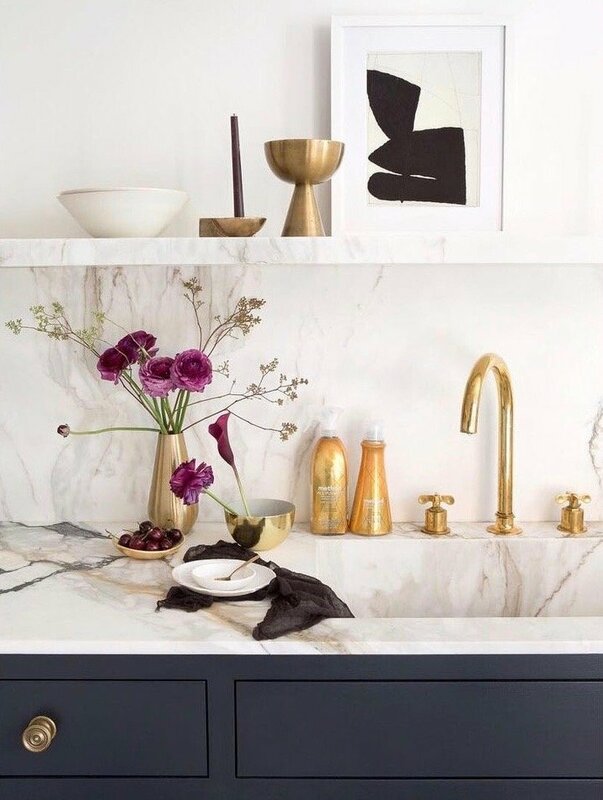 Kitchens and bathrooms designed around natural stone slabs have been popping up on the Instagram feeds of design lovers everywhere. It is one of the hottest trends in kitchen and bath design today. Three top designers explain what's behind the trend and offer tips on how to get the look successfully in your own home. Keeping up with the Jones' is out. Since slabs are like snowflakes--no two are alike--it is near impossible for homeowners to have the same looking stone. According to Young Huh, a New York City designer and board member of the National Kitchen and Bath Association, today's design savvy homeowners are "yearning towards unique extraordinary things." 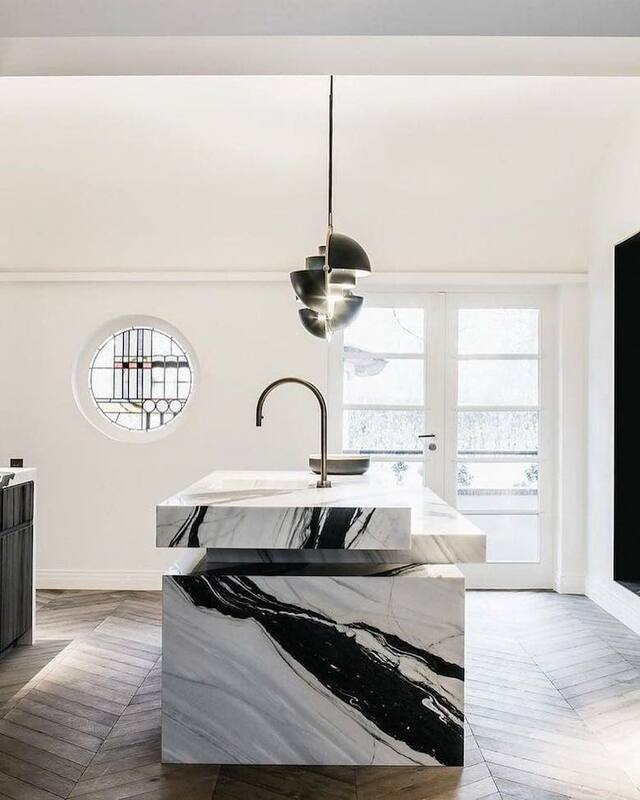 Huh adds that slab installations are so eye-catching now because "the organic and singular movement of natural stone sets it apart from manufactured quartz or what was popular forever, plain white marble." Of course, like all good trends, designing with natural stone slabs is not new at all. 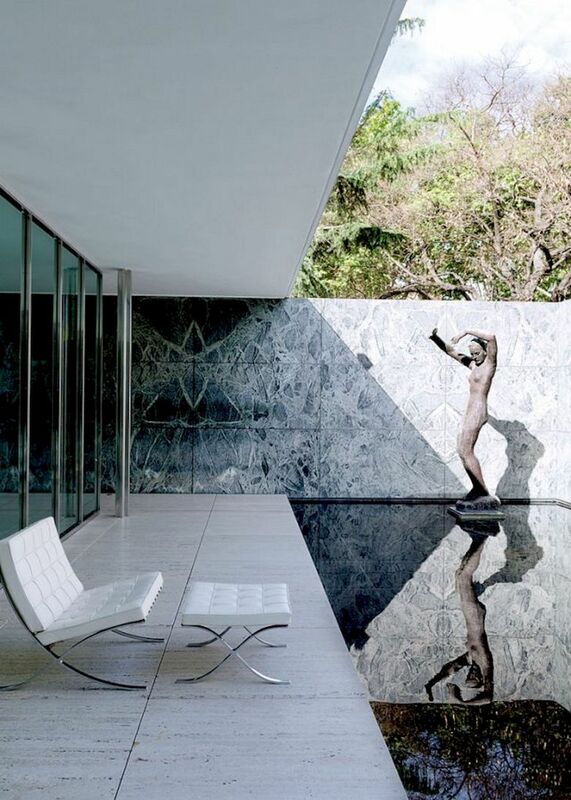 The Barcelona Pavilion, designed in 1929 by Mies van der Rohe, represents the quintessential use of stone slabs. It features large extravagant expanses of red onxy, marble and travertine, and little else. Mies' used this simplicity and natural beauty to achieve what he called "an ideal zone of tranquility." Perhaps a desire for that zen feeling also explains why today's frenetic homeowners are using large expanses of stone in their homes. 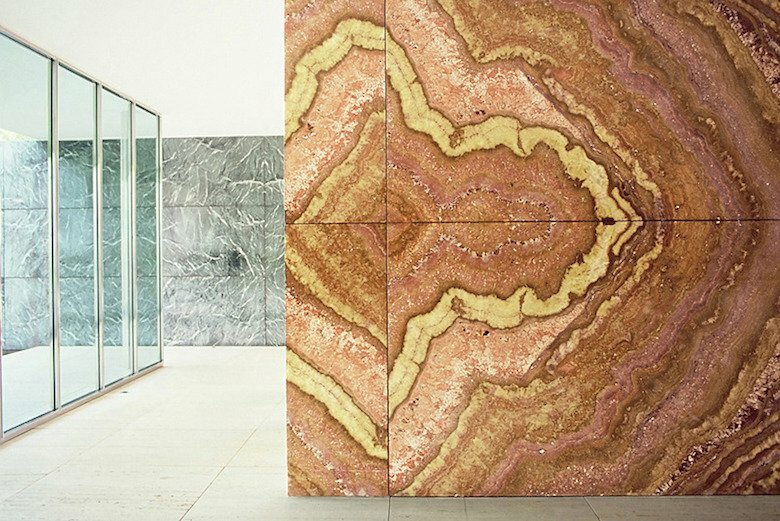 Learning from the Barcelona Pavilion, it's clear that slabs should be the focal point. "Install slab where it is most eye catching," says Huh, adding that the "look is minimal... but glamorous." Any large accent wall could work. Think the inside of a glass enclosed shower stall or the walls above a kitchen that has floating shelves. You don't want the beauty of the stone interrupted with medicine cabinets or other closed storage. Tina Ramchandani, recently named one of House Beautiful's Next Wave designers, cautions against using a solid stone slab on floors, especially where it can be wet. "I love the look of slabs on floors because you don't have the breaks of grout lines", but "tiles are safest in wet areas," because that grout offers traction. An uninterrupted slab floor can be slippery and dangerous. If you choose to install a stone slab, Ramchandani strongly advises that you visit the stone yard to see the entire span. "Since stone is a natural material there may be large blemishes or veining that you either love or hate." The finish also is important. "For kitchens, a leathered finish is great because you don't see as many fingerprints as polished, and it's easier to clean. A honed finish is another great low-maintenance option," says Ramchandani. Kitchen and bath expert Carla Aston bears her geological chops urging you consider whether the stone reacts to acidic chemicals like orange juice, wine or tomato sauce. Aston explains that "Calcareous stone reacts to chemicals (acid) and siliceous stone does not." She adds that "granite, soapstone, slate and quartzite will never etch..... because they are siliceous," while "marble, limestone, travertine, dolomite and onyx will." Certainly something to keep in mind when installing a natural stone kitchen countertop. Some homeowners happily accept (and even desire) the patina from etching, while others want their slabs to remain pristine. Marble kitchen island in the Anna Bond's home, CEO of Rifle Paper Co.
Are you ready to install a natural stone slab in your next renovation? I am having a visual crush. Photo credits: Denoit from Elle Decor. Second photo Reitveld Projects. Calderone kitchen photo by Sarah Elliot. Ellen Hanson photo via Vogue, photo by Martyn Thompson. Anna Bond kitchen, photo by Julia Robbs. Other photos unknown, please leave a comment if you know the source.